Antrim saw off London 1-13 to 1-8 at Corrigan Park to claim their first Division Four win of the league season. Ryan Murray's first half penalty helped move the Saffrons into a comfortable lead at the break, although London remained in touch throughout. Elsewhere in the division Derry made it four wins from four with a 2-8 to 0-9 victory over Wicklow. The Oak Leafers scored two first half goals in a dominant display. London came fast out of the traps and took the lead through David Dunne's goal as they sought to claim their second win of the campaign. Both sides ended the game with 14 men after Paddy McBride and Eoin Flanagan were shown second yellows. Although by no means a dominant display, the Saffrons were in control for the majority of the contest in Belfast with McBride playing a starring role in the first half with three well-taken points. 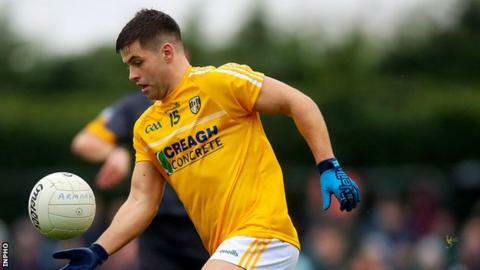 The game's defining period came at the beginning of the second half when Antrim stretched their further stretched their half-time lead into a seven point advantage. Although London remained close, late scores from Declan Lynch and Ruairi McCann secured the points. At Watty Graham Park Derry knew that a win would mean that ensure they and Leitrim enjoyed a four-point lead over their nearest challengers in division four. Chrissy McKaigue, captaining the Oak Leafers in the absence of Enda Lynn, scored the opening goal after Shane McGuigan found the Slaughtneil stalwart's run from midfield, allowing McKaigue to fist in. Their second came before the break in fortuitous circumstances when Mark Jackson's tame short kick-out fell kindly for Christopher Bradley to roll into the empty net. Glen clubman Ciaran McFaul added two well-taken scores on his home pitch as the hosts extended their lead to five points shortly after half-time. Wicklow remain third but are now four points adrift of the promotion places. Derry boss Damian McErlain was content that his side "got the job done" to move a step close to a Division Three return. "That's what's it's all about here. Defensively we're sound although we're probably still trying to find out feet going forward," said the Derry manager. Victory over Limerick next week could be enough to seal the Oak Leafers' promotion but McErlain is expecting a tough task at the Gaelic Grounds against a side beaten narrowly beaten by Leitrim on Saturday. "They probably should have beaten Leitrim in the sense that they missed a few goals chances in the first half."